Since the original publication of this report and map, known and estimated PFAS contamination of drinking water and groundwater have increased dramatically. In May 2018, the Pentagon disclosed a list of 36 U.S. military installations where tests found on-base drinking water contamination exceeding the Environmental Protection Agency’s lifetime health advisory for the fluorinated compounds PFOS and PFOA. The Pentagon also identified 90 installations where PFOS or PFOA released on-base has contaminated groundwater, in some cases migrating to off-base civilian communities. After cross-checking the Pentagon’s lists with our previously published data, we have added 78 military bases to our map. By our best count, as of July 2018, there are 172 known PFAS contamination sites in 40 states – more than three times the number of known sites when we first published the map in June 2017. But that number does not include public water systems with PFAS contamination. In May 2018, an EWG analysis of unreleased data estimated that more than 1,500 drinking water systems, serving up to 110 million Americans, may be contaminated with PFOA, PFOS and similar fluorinated chemicals. The EPA previously said about 200 systems were contaminated, but that number did not include systems with contamination below the EPA’s reporting threshold, which is too high to protect public health. Last fall, Sandy Wynn-Stelt of Plainfield Township, Mich., learned that her well is contaminated with fluorinated industrial chemicals at more than 500 times the Environmental Protection Agency’s “safe” level for drinking water. In January, test results showed she had 750 times the amount of one of those chemicals in her blood as the average American. Wynn-Stelt has lived across the street from a Wolverine Worldwide liquid waste dump since 1992. It is a known source of widespread contamination of area wells with fluorinated compounds, known as PFAS or PFC chemicals, which are linked to cancer, thyroid disease, weakened immunity and other health problems. Two years ago, her husband Joel died at 61 years old of liver cancer, which she believes was caused by PFAS pollution from the dump. According to the Grand Rapids Press, a state toxicologist called the area’s contamination “the stuff health department nightmares are made of.” That nightmare haunts a rapidly growing number of communities nationwide, with no end in sight. The latest update of an interactive map by EWG and the Social Science Environmental Health Research Institute at Northeastern University documents publicly known PFAS pollution from 94 sites in 22 states, including industrial plants and dumps, military air bases, civilian airports and fire training sites. It also shows PFAS pollution of tap water for 16 million people in 33 states and Puerto Rico. 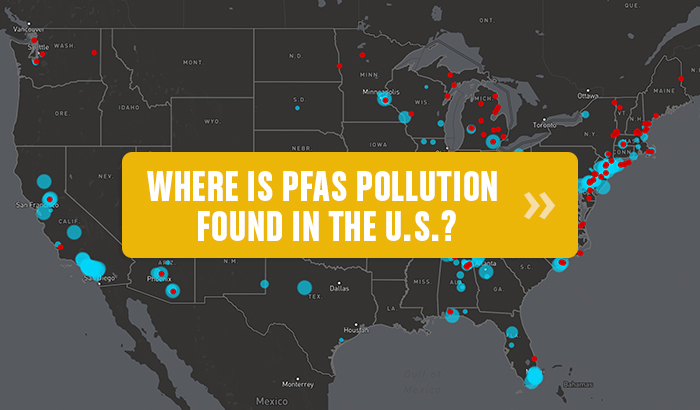 The map is the most comprehensive resource available to track PFAS pollution in the U.S.
Blue circles show where PFAS chemicals were detected from 2013 to 2016 in public drinking water systems. Red dots indicate a site in Northeastern’s PFAS Contamination Site Tracker. Clicking on a circle or dot brings up detailed information and provides links to more resources. When the map was first published 10 months ago, there were 52 known contamination sites in 19 states. Much of the increase since is in Michigan, where a virtual explosion of known sites has made the state the current hotspot of the PFAS crisis. The graphic below shows the year-by-year discovery of contaminated sites since 2001, when the EPA was first alerted to PFAS pollution of the Ohio River and tap water near DuPont’s Teflon plant in Parkersburg, W.Va. The interactive map also shows PFAS pollution of tap water detected in an EPA-mandated testing program under the Unregulated Contaminant Monitoring Rule. It focuses on the most-studied fluorinated chemicals – PFOA, formerly used to make Teflon, and PFOS, formerly an ingredient in 3M's Scotchgard. The two chemicals were phased out under pressure from the EPA after revelations that, for decades, DuPont and 3M covered up evidence of their health hazards, accumulation in people’s bodies and persistence in the environment. Both chemicals are now banned in the U.S., but manufacturers have replaced them with structurally similar, largely untested, chemicals that may be no safer. The Centers for Disease Control and Prevention has found these chemicals in the blood of virtually all Americans. Last year, an American Red Cross study found that the blood of the average American has 4,300 parts per trillion, or ppt, of PFOS and 1,100 ppt of PFOA. Sandy Wynn-Stelt’s blood has 3.2 million ppt of PFOS, the chemical in the Scotchgard that Wolverine Worldwide used to waterproof Hush Puppies and other brands of shoes. Under the EPA program, from 2013 to 2016 all large public water systems tested their treated tap water for PFOA, PFOS, and four closely related chemicals. EWG’s analysis of the results showed that PFAS chemicals contaminated 194 systems serving 16 million people. But the extent of tap water contamination is likely much greater. The EPA program covered only a sample of small systems, and did not cover private wells, which together provide drinking water for about a third of Americans. One lab that conducted tests for the EPA program re-analyzed its findings and estimated that 10 times as many water samples may have been contaminated, but at concentrations below the EPA’s minimum reporting levels. Since the EPA program ended, there is no ongoing nationwide testing of drinking water for PFAS chemicals. But other tests have found tap water supplies in North Carolina contaminated with a new PFAS chemical called GenX. DuPont’s own studies found that GenX causes cancer in lab animals, but it was not included in the EPA program. In response to public outcry, in January the EPA ordered tests for GenX near the West Virginia Teflon plant, which is now operated by the DuPont spinoff company Chemours, as is the plant responsible for the North Carolina contamination. The EPA has no legal limits for PFOA and PFOS in drinking water, only a non-enforceable health advisory level of 70 ppt for either chemical or the two combined. But there is evidence that a safe level of exposure is much lower. In a 2015 study by the National Toxicology Program and the University of North Carolina, researchers could not find a level of PFAS chemicals so low that it did not harm mouse fetuses during critical windows of development. In 2016, Philippe Grandjean of the Harvard T.H. Chan School of Public Health and Richard Clapp of the University of Massachusetts at Lowell calculated that an approximate safe dose of PFOA and/or PFOS in drinking water is 1 ppt. Wynn-Stelt’s well has more than 37,000 times that much PFOS, and a well near another Wolverine dump less than 10 miles away has almost 59,000 times as much. In 2016, Vermont adopted a legal limit of 20 ppt for both PFOS and PFOA in groundwater, and an identical advisory level for tap water. In October, Minnesota set advisory levels of 27 ppt for PFOS and 35 ppt for PFOA in tap water. In November, New Jersey accepted state scientists’ recommendation of legal limits of 14 ppt for PFOA and 13 ppt for another fluorinated chemical, PFNA, in tap water, which are expected to go into effect next year. In January, Michigan adopted a legal limit of 70 ppt for PFOS and PFOA in groundwater used for tap water. Some states have sued PFAS makers for contamination. In February, Minnesota reached an $850 million settlement with 3M in a lawsuit that said the company knowingly contaminated groundwater with PFOA and PFOS. That same month, Ohio sued DuPont and Chemours for an unspecified amount over PFOA contamination from the West Virginia Teflon plant across the Ohio River. One community too small to be included in the EPA test program is Hoosick Falls, N.Y. In 2014, a resident commissioned tests that found high levels of PFOA in the village’s drinking water. The source was a plant operated by Saint-Gobain Performance Plastics and later by Honeywell International. It has since been declared a federal Superfund cleanup site. Other New England towns with similar factories tested their own water and also found PFOA or PFOS contamination. Around the same time, PFAS chemicals from firefighting foam were found in the water near military bases, airports and fire department training sites. Since then, the number of known contaminated sites, as tracked by the Northeastern project, has mounted rapidly: eight new sites in 2015, 23 in 2016, and 17 in 2017. To monitor the spread of the problem, the Social Science Environmental Health Research Institute at Northeastern University developed the PFAS Contamination Site Tracker. It details information for 94 industrial or military contamination sites in 19 states and Guam, plus sites in Australia, Canada, Italy, Germany and the Netherlands. Michigan has the most known contamination sites with 15, followed by New York with 10. Some contamination levels are extremely high. The highest level recorded in drinking water is in a private well in Algoma Township, Mich., with 58,930 ppt of PFOA and PFOS. Groundwater at Base McGuire-Dix-Lakehurst, near Trenton, N.J., was found to have 580,000 ppt of PFOS. Of the sites tracked by the Northeastern project where the contamination source is known or suspected, 35 sources are military bases or airports; 32 are industrial facilities, including dumps and civilian airports; and five are civilian firefighting sites. Some locations have multiple sources of contamination. In May, EPA Administrator Scott Pruitt will convene a national summit on PFAS contamination of tap water. The summit will supposedly provide “critical leadership” to states grappling with the problem – but it is the states who have taken the lead on dealing with the crisis, while the EPA has dragged its feet for almost 20 years. Sens. Kirsten Gillibrand and Charles Schumer of New York have introduced a bill to require the EPA to set drinking water standards for PFOS and PFOA. Reps. Frank Pallone and Josh Gottheimer of New Jersey have each introduced legislation to require the EPA to create an enforceable standard for perfluorinated chemicals in drinking water within two years. Sen. Jeanne Shaheen of New Hampshire secured an amendment to the 2017 Defense Authorization Act funding the Agency for Toxic Substances and Disease Registry to conduct a national study on the health effects of PFAS chemicals in drinking water. Rep. Sean Patrick Maloney of New York has introduced legislation to require the Centers for Disease Control and Prevention to conduct a similar health study. It is unconscionable that almost two decades since the beginning of the PFAS crisis, the EPA has taken only the most feeble steps toward setting legal limits. National standards would not make the crisis disappear overnight, but would require all public water systems to test for PFAS chemicals and treat tap water to reduce contamination levels. The current patchwork of state standards is inequitable and unfair. It means that drinking water in New Jersey will be subject to the nation’s strictest legal limit for PFOA – but across the state line in Delaware there is no legal limit, only the EPA’s advisory level, which is five times higher than New Jersey’s standard. It is only a matter of time until Americans in another community learn that their water is contaminated with PFAS chemicals. A national crisis demands a national response. Northeastern student Cole Alder conducted research to update known contamination sites. Soren Rundquist, EWG’s director of spatial analysis, created the interactive map. PFAS stands for per- and polyfluoralkyl substances. These compounds were historically known as PFCs, for per- and polyfluorinated chemicals, a term still sometimes used. A part per trillion is about one drop of water in 1,000 Olympic-size swimming pools. In Delaware, state and local officials have taken some steps to clean up known PFOA contamination, but the state has not adopted an enforceable standard.